This was their Sunday buffet, but it's a little different because they give you a buffet menu where you can select different items and they are brought to you fresh the same way as if you were ordering off any menu...but, it's all you can eat. This was a bit of a gringo restaurant. 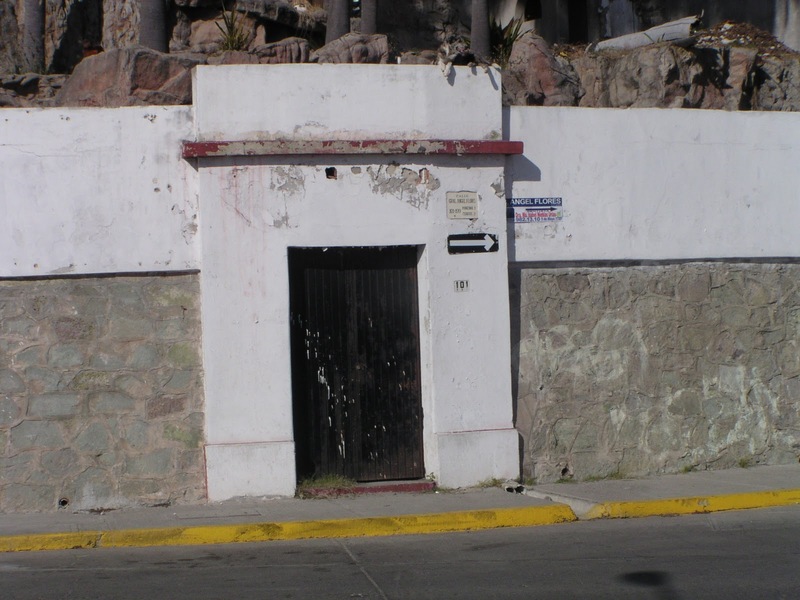 Very few Mexicans would go to this place. But the price for the buffet was reasonable, at 115 pesos ($8.97) per person, tip included. Lee and Ruth at the entrance to the restaurant. 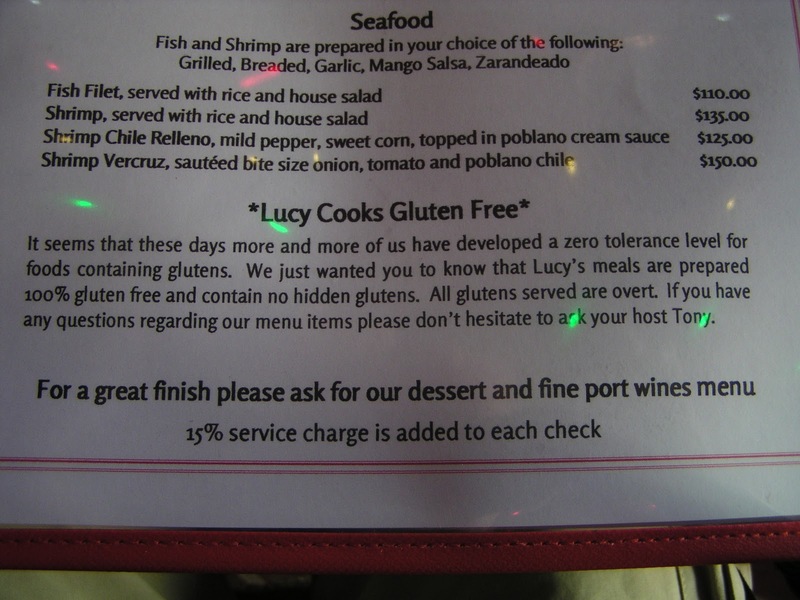 The menus were in English or Spanish, and they even had a comment about gluten free! 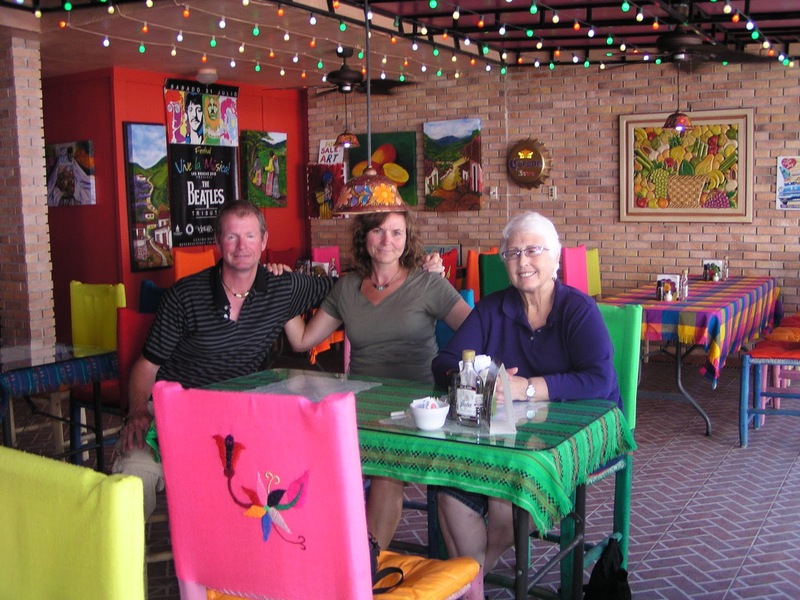 Kevin, Ruth, and Lee in this very colorful restaurant. We had ice cream for desert. 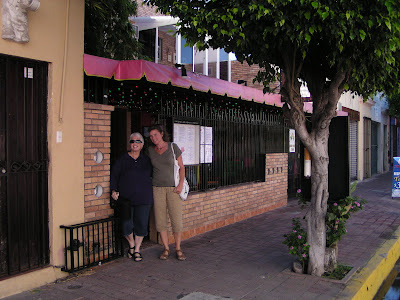 It was not on the menu, and when we got the bill, it turned out the ice cream was 60 pesos each! This was a little ridiculous, but the food had been so good it didn't matter. This was one of the best restaurant meals we have had in a long time and we were so full we only needed a bowl of soup for dinner later in the day. We walked over to the plaza in the historic central area of town. 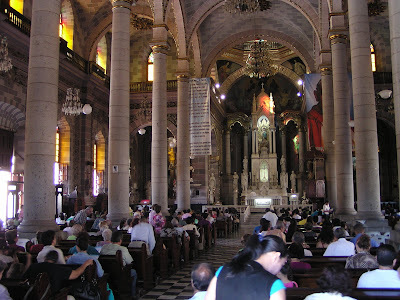 I wanted a pic of the interior of the cathedral, and it was Sunday so a service was going on. The outside of the cathedral was nice, but nothing special. The inside was really well done though. Lee went and did some shopping and Ruth and I sat in the plaza and watched the children chasing the pigeons and feeding them. This little guy was having fun chasing the pigeons. 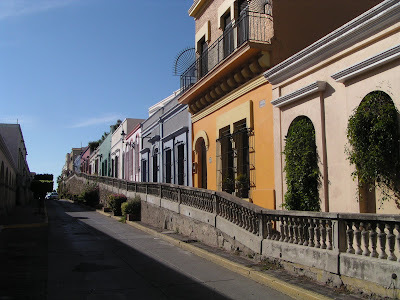 A nice looking street near the historic section. Finally made it to the ocean! 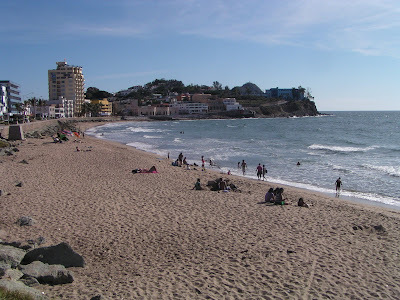 This is the beach at the historic part of town. Check out the dog relaxing on top of the wall! The hotel zone in the distance. We probably won't even go there. 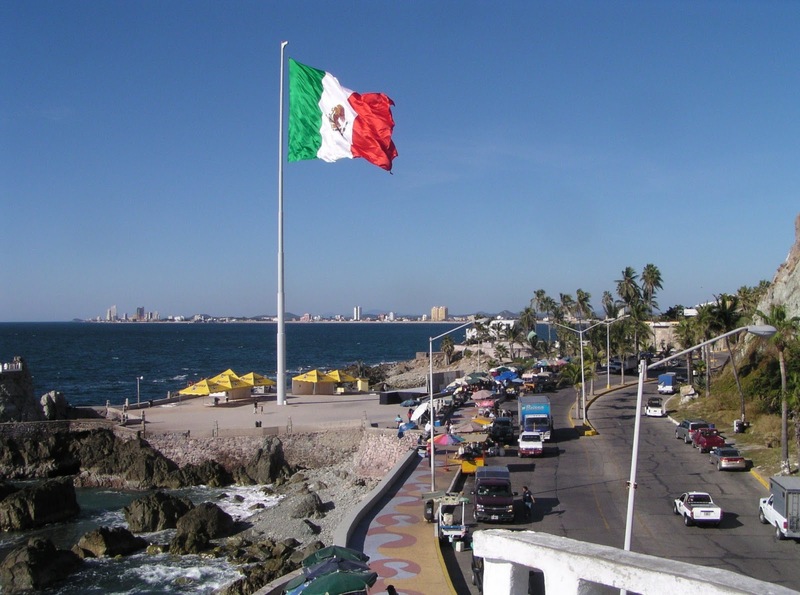 Sunday was Mexico's Revolution Day, and today is a holiday. Surprisingly, there were not many people around, it seemed unusually quiet. It turned out the parade had been at 8am, so we never made it to that. But we had a good day wandering around, and a fantastic meal out. Today, we're headed back to the central area where we will meet with Contessa and Colin, RV'ers from British Columbia who live here for the winter. Another beautiful day in Mexico! 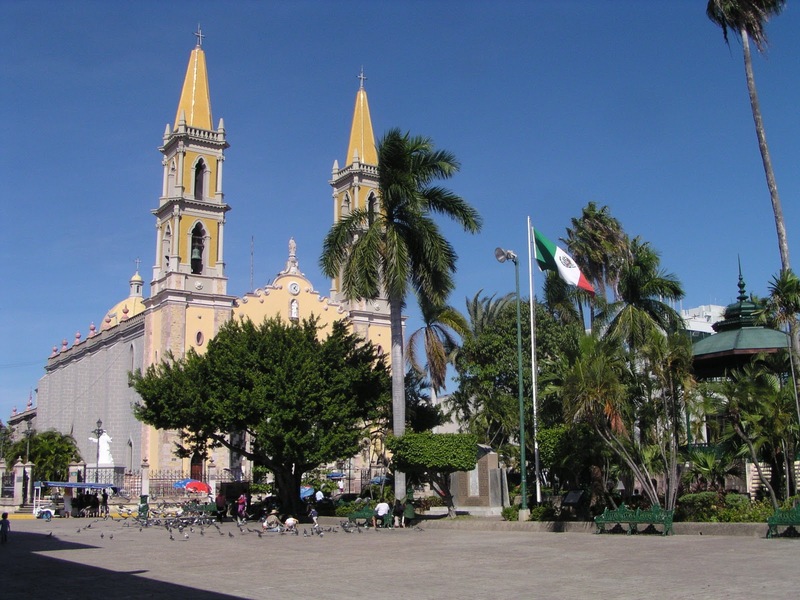 Beautiful town, we always try to visit historic churches. Love the cathedral, and your header picture is amazing! I thought Ruth had a strange looking hat on too when I first looked at the picture. But I love the colors in the restaurant. Glad you got to see the ocean finally. Add me to the list of strange hat. Kevin you ought to look into having a magazine publish some of your pictures....they are always so good, you have a real eye/talent...maybe a travel agency or travel magazine. Great shot Kevin. Did you see the air show? Good to see Mexico is accommodating gluten free people. 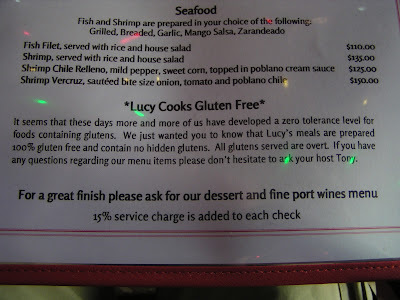 I have yet to see a restaurant here in Canada that can claim that everything on the menu is gluten free. They could learn from Mexico! Looks like you're having a great time with perfect weather. Getting cold up here in the land of ice and snow! Sounds like a wonderful day in town and nice meal, so many great places to eat there too. But like you said 60 pesos for ice cream, wow! Have fun with Contessa and Colin tomorrow and say hi for us! A short trip to the Isla would be worth while too. What beautiful photos Kevin ~ Sounds like a really yummy dinner too... Mexican is my favorite but the food in Mexico is not like the USA... Still really good though! Nice beach, wish I was that dog laying there. Looks peaceful! Ruth, nice hat (snicker). Was going to say something about the lampshade on her head already, but see that others beat me to it! 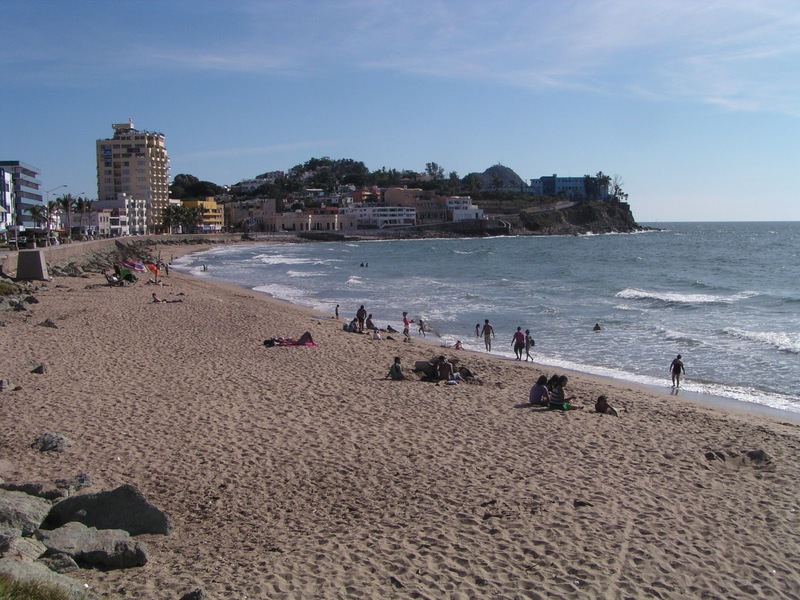 Enjoy Mazatlan, maybe pretend you are tourists and go down to the hotel strip anyway, might get a few free breakfasts out of it! (that's what I would do!). A glorious photo of the ocean. The restaurant looked lovely. We are friends of Colin and Contessa too! We were just in Mazatlan in October and hope to go back in February. A good Canadian Ex-pat friend has recommended Te Amo Lucy to us, but we haven't made it there yet. We will put that at the top of our list for next time. 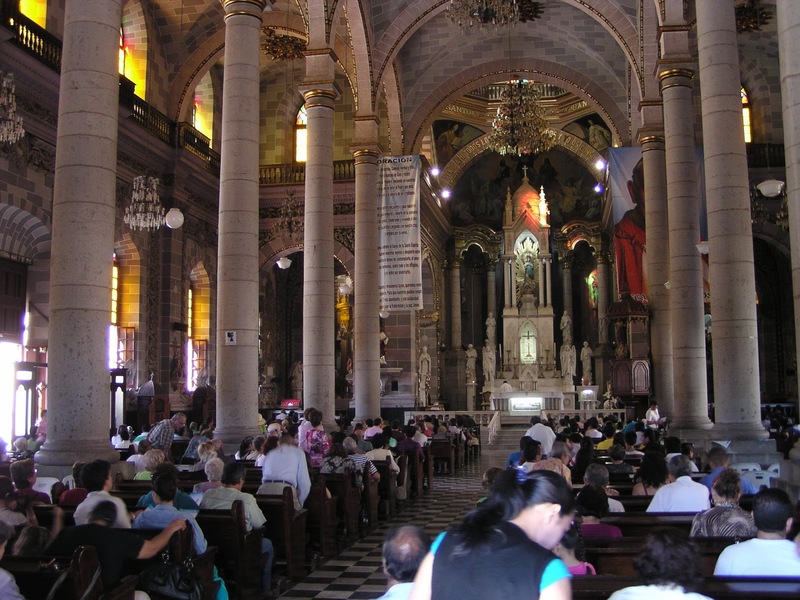 I laughed at your outside picture of the cathedral-I have one almost identical. 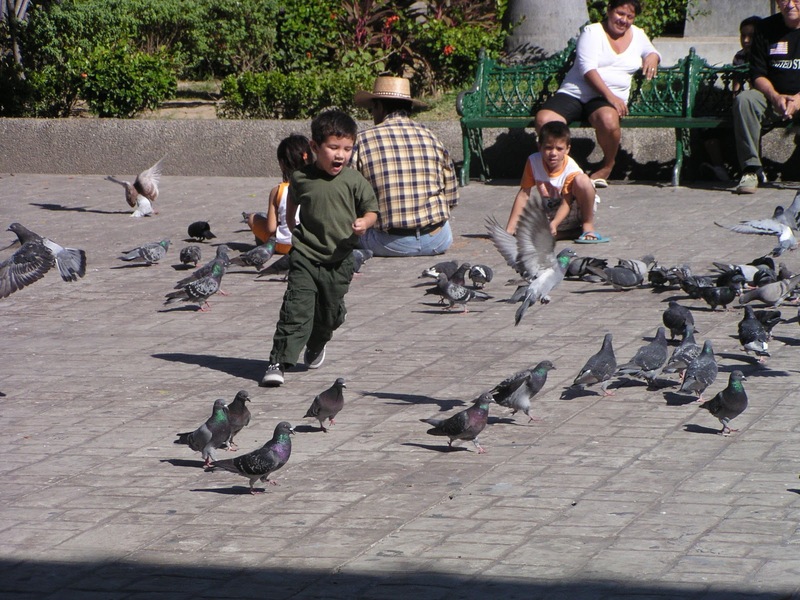 I also have a pic of the kids feeding the pigeons, probably in the same spot. What a photogenic city! Glad you had such a good time with Colin and Contessa! 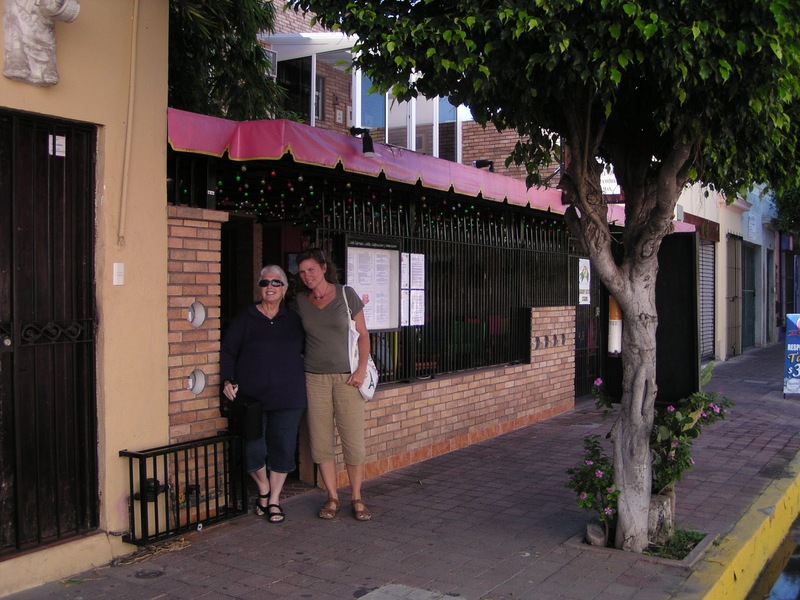 As co-owner of Te Amo Lucy's I would like to thank you for stopping by and for the great review. I would like to address your comment about the ice cream price being ridiculous. $60.00 pesos or about $4.29 USD for 2 generous scoops is not that far out of the park. Most restaurants around town charge about $45.00 pesos for factory made artificial ingredients and fillers ice cream. Our ice cream is hand made in house from the freshest and purest ingredients like heavy cream, egg yolks real vanilla beans, pure cocoa and on and on. Each flavor takes me a full day to produce. Spending an extra dollar or so for our product ain't so bad, is it? Just thought you should know.